Would you need extra support in a power cut? Generally speaking, power cuts don't happen very often but if the electicity network is damaged the lights across parts of Essex may go out. 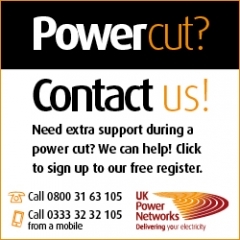 is yes, did you know that UK Power Networks provide extra support to vulnerable people during a power cut. You need to sign up to their Priority Services Register. For further details visit the UK Power Networks website.